When it comes to day trips, we Californians are pretty spoiled. With cheap airfares to Vegas, Seattle, and (sometimes) San Francisco, a quick getaway is something that we can afford a few times a year. A day or weekend spent in Temecula, L.A., Palm Springs, or anywhere in between can be the perfect weekend vacation when we need to decompress. Also on the list of places for an easy, inexpensive getaway: Phoenix. A flight is super quick and the drive is just over five hours. Due to its soaring temperatures, it’s not always on the top of my list of places to visit, but on a recent trip with my fiance to watch the Cardinals play (St. Louis not Arizona), I found the fun along the way. The drive from the southernmost tip of California into Arizona is an uneventful, yet scenic one. The wind turbines near El Centro, the mountains, and cacti dotting the landscape makes it seem like something straight out of a Sci-Fi movie, even more so when driving back in the dark. The turbines have lights that make them glow red on and off. We left on a Saturday morning with a stop halfway for lunch at Texas Roadhouse, a chain restaurant, but one that I miss. The rolls with cinnamon butter! As we got closer to Phoenix, we were faced with pouring down rain. It continued as we made it to downtown where we booked a stay at the Westin (333 North Central Ave.). We use Hotels.com to book our accommodations when we travel. The site has a “punch card” system that gives you one free night after ten bookings. After doing a little research online, I read there was a cheaper parking option in the lot across the street. For $12, we were able to park for 24 hours, a much better fare than the valet at the hotel. Plus, the stadium and everywhere we went were all within easy walking distance. Chase Field is situated among hotels, businesses, and a sprinkling of restaurants in one of the downtown areas of Phoenix that’s also right by part of ASU campuses. It smartly has a retractable roof that allows for air-conditioned facilities when the temperatures get too high. The only downside is that if you are there for a Sunday day game (as we were), hardly anything around the ballpark will be open. My fiance is a huge baseball fan and I enjoy watching the game. However, it’s the food that gets me most excited. Nachos in helmets, towering ice cream cones, baseball parks keep trying to one up each other with the concessions they offer. Chase Field has pretty simple selections, but their prices are fantastic. 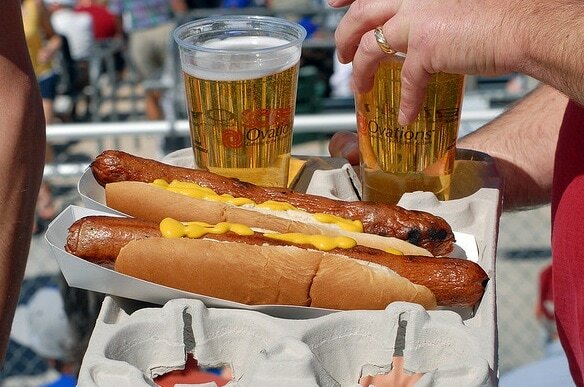 There is a value menu that offers small sodas, corn dogs, and hot dogs each for $1.50. That’s incredible when it comes to baseball park prices! You can also get the “specialty beer” (Miller’s Lite) for $4. We made it for both the Saturday evening game and the Sunday day game, with the St. Louis Cardinals clinching the National League Central Division, before driving back to San Diego. Although our trip was a short 36 hours, it was a nice way to unplug and take a break from the day-to-day grind. On our drive back, we stopped at an all-you-can-eat Chinese and Mongolian BBQ restaurant and reveled in the simple pleasures and good fortunes that travel and cheap eats can bring. Courtney Hartmann is a freelance writer and social media junkie. Korea-born and Kansas-bred, this girl has a zest for life on the move. She’s called both coasts home, NYC for a brief period and San Diego since 2010, to explore new opportunities and fun adventures. Connect with her on Twitter and Instagram at @mscourtneybeth.